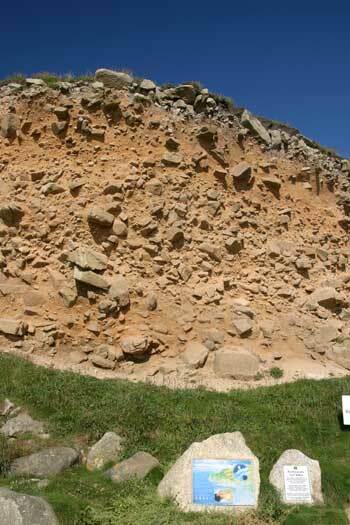 Even the oldest rocks of the Lizard have undergone metamorphic transition over their lifetime, with the intrusion of igneous rocks. The famous serpentine stone in its green and red varieties has found its way across the world, taken as a lighthouse or ornament, a momento or souvenir from a visit to the Lizard peninsula. 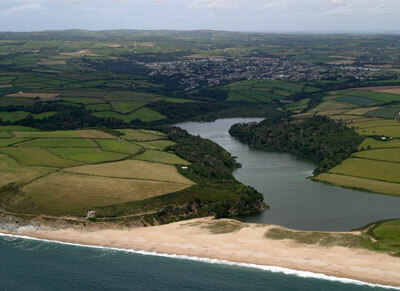 Cornwall's scenery is characterised by its geology, particularly its granite, which shapes its uplands and moors. The Land's End peninsula consists entirely of granite which gives it its unique appeal, rocky cliffs carved into pillars and blocks by time, inland moors with carns and craggy peaks and one of Cornwall's most popular rock climbing areas, Bosigran. Extending along the central spine of Cornwall these granite bosses extend from the Isles of Scilly to Land's End,Tregonning, Carnmenellis, Redruth and Carn Brea, Helman Tor and the Luxulyan area of Central Cornwall to Bodmin Moor in the north and into Dartmoor in Devon, with another small granite intrusion in south east Cornwall at Gunnislake and Kit Hill. 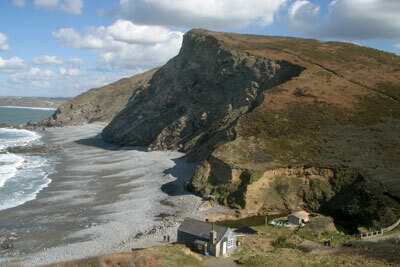 Some fossils can be found in Cornwall in the metamorphic and sedimentary rocks from the Devonian and Carboniferous seas. Bude, Padstow, Trevose Head and Trevone are some of the best areas of North Cornwall for discovering fossils including brachiopods, sea lilies and bryozoa. The north coast of Cornwall provides many fascinating geological sites including: the visually stunning Millook Haven with its sandstones and shales folded in an amazing zig-zag formation; Lanterdan Quarry near Trebarwith with its towering slate pillars; the raised beach at Porth Nanven on the Land's End peninsula; St Agnes Beacon, once an island; Cligga Head, near Perranporth, a granite outcrop with exposed greisen veins; and the Rocky Valley, a gorge near Tintagel. 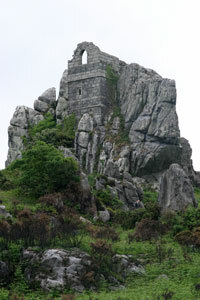 Central Cornwall boasts one of the strangest sites, Roche Rock, an outcrop of rock rising from an otherwise normal area crowned by the ruins of a 15th century chapel. The view is quite unexpected and is well worth a visit. 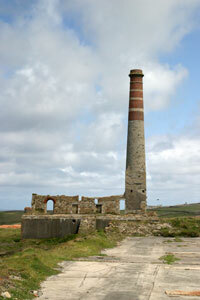 Bodmin Moor offers some fascinating sites of the so called 'Cheesewrings'. 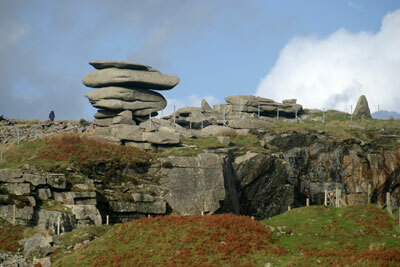 The best is on Stowe's Hill, a short walk from the village of Minions on the east of Bodmin Moor. Cornwall's wealth of geology resulted in a rich mineralogical history, which was the mainstay of Cornwall's industry for several centuries. 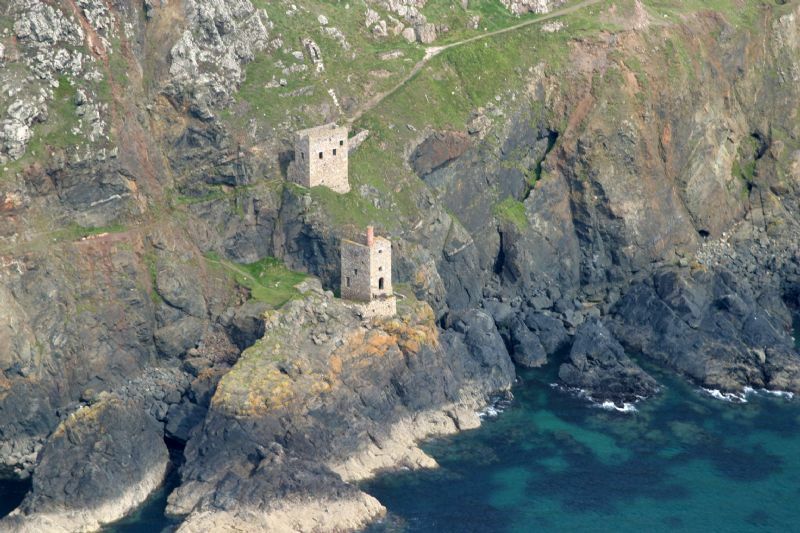 The picturesque stone engine houses and chimneys which are scattered across Cornwall's landscape are a reminder of this industrial activity and are now recognised as a World Heritage Site of international importance. Today, these stone monuments to a bygone age are appreciated by visitors and residents alike, who study and preserve them and the minerals and techniques associated with this industry. Mineralogists will find a fine collection of Cornish minerals extracted from mines around Cornwall housed in the Royal Institution of Cornwall Museum in Truro, including: cassiterite (tin oxide); chalcopyrite (copper and iron sulphide); chalcocite (copper sulphide); galena (lead sulphide); native copper (pure copper metal in flattened leaflike sheets); cuprite (red copper oxide); haematite (iron oxide); zinc blende (zinc sulphide); wolframite; iron pyrite; siderite (iron carbonate); malachite; bournonite; and cerussite (lead carbonate). The economy of Cornwall depended for many years on the mining of tin, copper, lead, zinc, manganese, iron, wolfram, silver, antimony and uranium. The main mining areas of Cornwall were: St Just in Penwith, Botallack, Pendeen on the Land's End peninsula; mines around Mount's Bay; Breage and Helston; St Ives area; Camborne, Redruth, Gwennap, Chacewater, St Day; St Agnes and Perranporth; Callington, Gunnislake and East Cornwall. 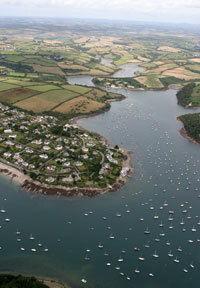 Central Cornwall, around the St Austell area, is still famous for the production of kaolin or china clay used in the ceramic industry and in paper. Huge open cast pits can be seen, some of which have now been reclaimed and the snow white towering pyramids of this area are known by locals as the 'Cornish Alps'. 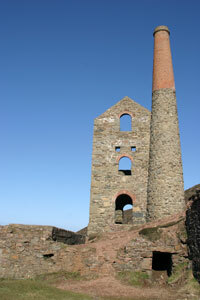 Mining in Cornwall and the sites associated with it have been recognised as internationally important and awarded the status of being a World Heritage Site. 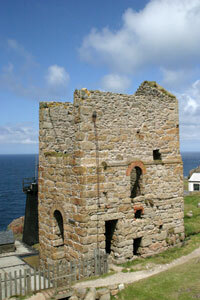 The World Heritage Site encompasses mining landscapes dating from 1700 to 1914, when deep hard-rock mining was developed in Cornwall and when major developments in technology within Cornwall helped to transform mining both locally and worldwide. 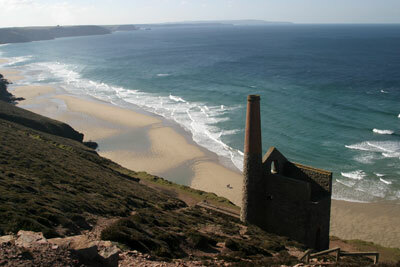 The ten areas which are included in the World Heritage Site, chosen for where the physical remains of mining from this period are best represented include: St Just in Penwith; Hayle; St Day/Gwennap; Camborne/Redruth; Godolphin/Tregonning; Wendron; St Agnes; Caradon; Luxulyan Valley and Charlestown; Tamar Valley and Tavistock. Other economic geology still being carried on in Cornwall is the quarrying of certain types of stone. In Delabole, in North Cornwall, slate is quarried from a huge open pit just outside the village. The quarry is a fantastic sight at over 500 ft deep and has been in production since the 1200s. Granite is still quarried at De Lank near St Breward on Bodmin Moor. For more information about individual sites, visit our A-Z of Cornwall, where you will find information in our index of town and individual site pages.